This is a photo, taken by Green Gordon, whose Flickr page is here, of Edinburgh’s Pubic Triangle, which Mat told me about yesterday. Apparently you join the dots between three massage parlours or something and it make a triangle of sleaze. He posted this in response to it coming up on today’s first Collings & Herrin Podcast Live gig at the GRV. 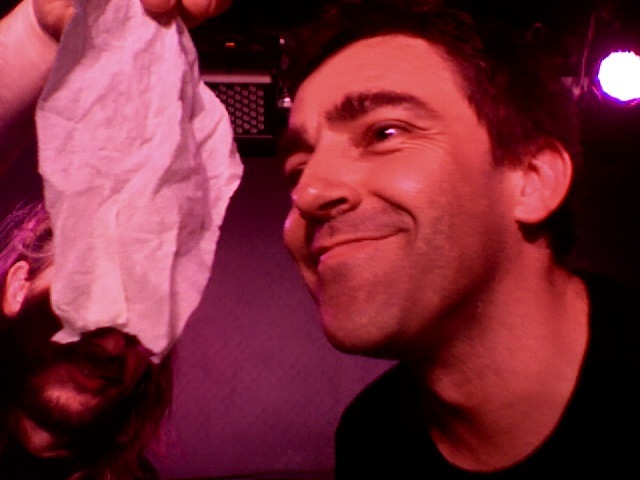 Remember, in 2008, we tested the water by doing one gig, in the morning, at the Underbelly. Last year, we did five, again at the Underbelly. This year, it’s ten, in two sets of five, Wednesday to Sunday. We came to the GRV last year – it stands for Green Room Venue, unless the person who shouted that out was a trickster – to see Michael Legge and Johnny Candon shout some sketches. We are in what I think is the biggest of the three rooms at the GRV, in the basement, which, as you can see in these photos, taken by this laptop, seats around 80 nerds. In the first picture you will see a nice couple who happened to be ex-boyfriend and ex-girlfriend in the front row, and Green Gordon himself, spotlit, in the second row. All three of these people made the first podcast gig better, by willingly sitting in Richard Herring’s eyeline. And in this picture, you will see a single woman in the front row, who willingly allowed Richard Herring to ascertain this piece of information, and a blonde woman in the second row, aisle seat, who seems suspiciously unhappy about being in the photograph at all. Don’t know who she was. Perhaps she is a criminal of some kind. Anyway, we managed to get through a whole hour without having a single clue as to what we should say, but that’s the spirit of the podcast. It’s like being in Richard’s attic, except with 80 people laughing and not laughing at what we say. The people who work at the venue are very nice, and the dressing room behind the stage, which they apologised for, was the height of luxury, with sofas, and an empty fridge. 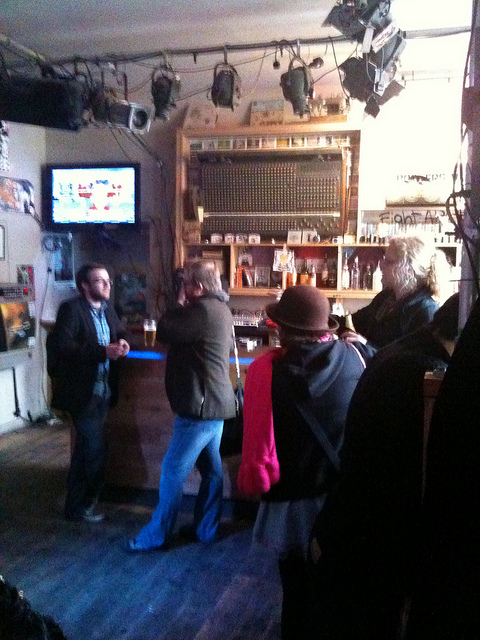 Unlike the dressing room at the Underbelly we had last year, it did not have a pint glass full of piss in it. In the first of ten live podcasts recorded at the GRV at the Edinburgh Fringe (but still officially number 122), we set the scene for our tenure in the land of the incomprehensible town name: the Young Ones-style flat, Justin Moorhouse’s role as the kitchen Buddha, the capacity of the tall bedrooms to accommodate a human pyramid featuring Tom Wrigglesworth and the tallest of the Penny Dreadfuls, and the intrigue of the washing up rota. Coping with the very real possibility of a beer-batter-related toxic accident, the spectre of Herring distracts himself by indulging in some PG-rated banter with our audience, some of which involves his “disco stick”. Sponsored by Wet Ones, which are just the thing after a wet one. 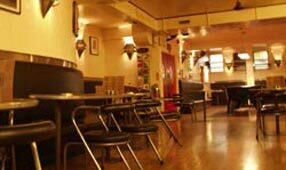 After the show, we sat in the amenable bar of the GRV, which is what we will do after every show, and communed with the nerds. Here are some, in another picture taken by the prolific, and insanely patient, Green Gordon, who does actually always wear green, like a member of Robin Hood’s merry band of outlaws, except armed with a camera. So, only nine more to go. In case you’re interested, Richard came to see Secret Dancing this lunchtime, and brought bad juju with him. Having pretty much nailed the technical side of Bannermans, thanks to Chris who works there, and the ever-present Mark, Frog and Charlotte, it was something of a disappointment to find, at midday, that the PA wasn’t working. Chris and another man also with tattoos did a valiant job of replacing fuses, but it was not going to be, so I had to do my show acoustically, using the natural resonance of the space, and forgo the three bits with music. 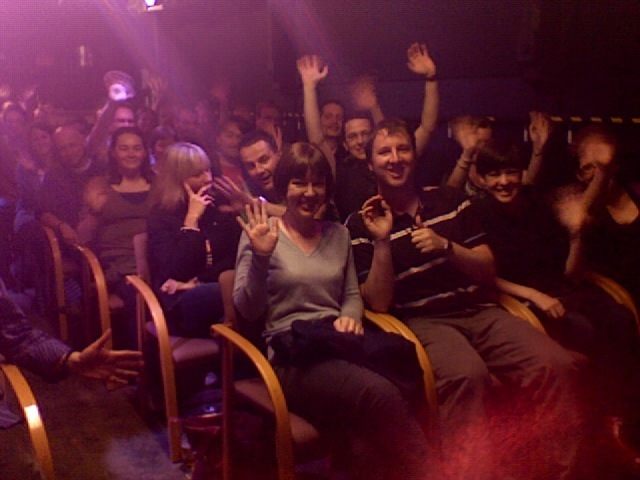 We had another full house though, and although to do this more than once would kill my voice, I think it was OK. I even fell off the stage at one point, but recovered by pretending I wanted to go down into the audience. I didn’t. It’s good to have a technical upset. We coped. It’s what we do. We did not panic. In private, Richard told me he thought my show was good, but would deny this in a court of law, instead spending the whole of the podcast mocking me for the amateur nature of my Lenny Bruce-style assault on live comedy. I think I am too edgy for Richard, who is more of a light entertainer. What a lovely way to spend the evening – it had to happen – staying in, eating bagels, drinking herbal tea and watching the semi-finals of Celebrity Masterchef, followed by an engrossing talk about food and cooking with Tom, back in from his show. Richard and his imaginary girlfriend are now watching Sherlock, so I am hiding. Because it has been a Wednesday, I have also been doing my Radio Times work, remotely. Having produced 600 words on Amy Adams, I still have to review Thunderbolt and Lightfoot, so I must stop here. Oh, and Richard left his bank card in the City Cafe, and someone handed it in at his venue. What a nice city. 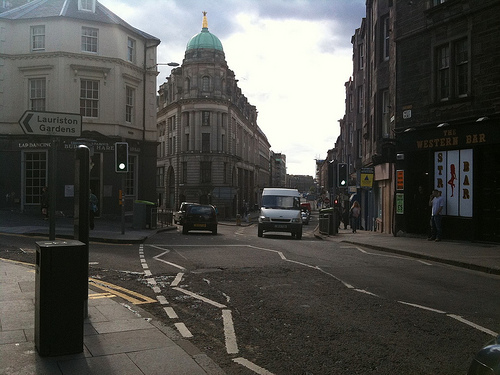 This entry was posted in Edinburgh 2010 and tagged Herring, Podcast by Andrew Collins. Bookmark the permalink. You know that three points forming a triangle when you join them up is nothing special don’t you? The only way three point would not form a triangle when you join them up is if they were in a straight line, or if any of the points was in the same place as one of the others. I feel sure the triangle can’t have been the notable thing about this, but when you mentioned it on the podcast it sounded to me like that it somehow was. The problem with having a blog is that sometimes your readership may include a pedantic mathematician with insomnia who ha a tendancy to miss the point. 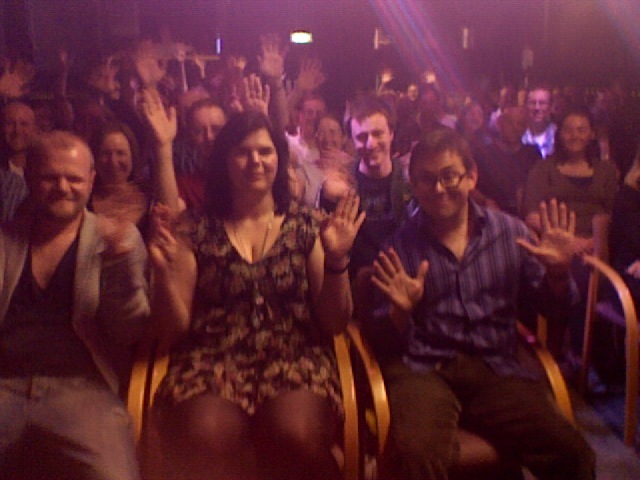 I am the Ronnie-Corbett-looking-M-F in the front row in a purple shirt. Having listened to every podcast I was very excited to finally witness one at such close quarters. So excited, in fact, that my star-struck little brain froze up whenever Richard engaged me in conversation. As a result I missed the opportunity to become a small part of this thing I love. It feels the way I imagine it would feel if I passed up an opportunity to have a kiss with Heather Graham. The regret will haunt me for my entire life.